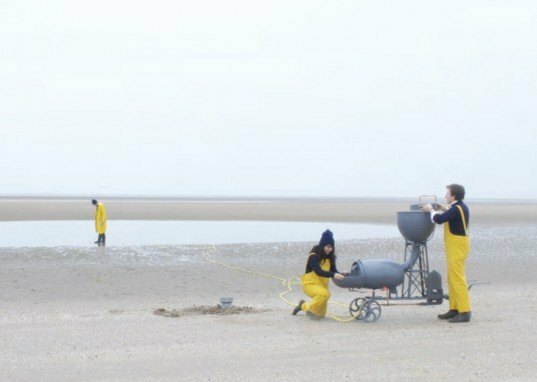 Inspired to rid our oceans of plastic pollution, three Royal College of Art graduates of Studio Swine developed a project called the 'Sea Chair'. Their new device completes a process that collects, sorts and recycles floating plastic garbage, then transforming it into usable plastic chairs. A contender in the Victorinox Time To Care Award, the project has the potential to be realized if it makes it to the top three in the contest. Islands of plastic waste can be found in our oceans around the world. The largest, the Pacific Garbage Patch, is a collection of floating plastic, debris and waste that spans twice the size of Texas. In the patch, the plastic is broken down, finally into small pellets, called nurdles. The team found these tiny pieces to be perfect components to create 3D printed plastic chairs. 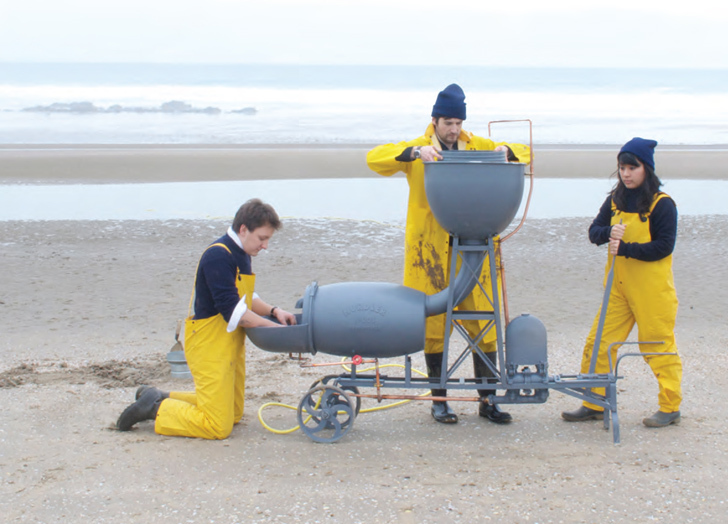 The fishing trawler of the device sifts plastic nurdles from the polluted waters and from beaches, which are often neglected during beach cleanups because they are so small. Since the nurdles are really broken down pieces of a bigger garbage patch, they are packed with harmful chemicals that they’ve absorbed over time, amplified from spending considerable amounts of time in the sun. As they pass through the water, they pass along the chemicals to the marine life they encounter. If funded, the Sea Chair project would employ a floating factory ship, that harvests the marine waste, and recycles it on board into “sustainably sourced” chairs. The chairs would then be sold to help the communities in which they were created. To vote for Sea Chair, visit the Victorinox Time To Care Award Site here. I like the idea, what better way to get rid of debris in the Pacific Garbage Patch. Islands of plastic waste can be found in our oceans around the world. The largest, the Pacific Garbage Patch, is a collection of floating plastic debris and waste that spans twice the size of Texas. In the patch, the plastic is broken down, finally into small pellets, called nurdles. The team found these tiny pieces to be perfect components to create 3D printed plastic chairs. The fishing trawler sifts plastic nurdles from the polluted waters and from beaches, which are often neglected during beach cleanups because they are so small. Since the nurdles are really broken down pieces of a bigger garbage patch, they are packed with harmful chemicals that they’ve absorbed over time, amplified from spending considerable amounts of time in the sun. As they pass through the water, they pass along the chemicals to the marine life they encounter.